Max came running into the house breathlessly exclaiming, "Mama! For you!!" He handed over a large, but spindly, blackened, and crumbly, twiggy-looking thing. I tried to figure out why it was for me...and then I noticed, there on the ends of the brittle stems were tiny dried flowers. The only ones around this time of year for a boy who wants to pick flowers for his Mama. Thank you, Max; I love you too. Because it is almost 7:00pm. It's become a family event a couple of nights per week. The boys love it. We HAVE to get a video of them watching the big fight scene at the end. Oh how fun it is when the bad guys get it!! We had more snow overnight to replace what we used up yesterday. 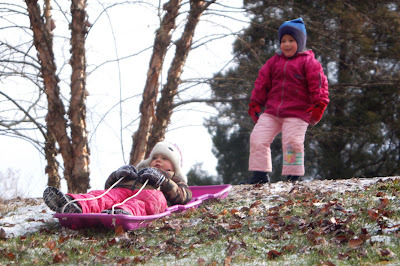 It was too cold for snowman making but ok for sledding which was a fun thing to do. Poor Vitali felt that he didn't get enough sled time. I said to him, " Vitali! You don't look very happy." "I am happy." he replied. But he was just having a grumpy moment. ...as you can see, he got sled time too! He and Ivy were snow buddies. I think they felt the pink-pants bond. But we really did have a good time! Here are a couple more pictures I thought were cute and fun. To celebrate one year being home: Snow! Today marks the one-year anniversary of us being home and the beginning of our family being together. This is the day that we count as our real homecoming. Last year on January 19th, I had managed to hold back all the tears until I saw the girls running toward us in the airport. Many of our friends were there with signs reading Welcome Home! in Russian. What a relief it was to be home! This January 19th, we got our first 'real' snow of the season. The kids were so excited and it seemed that the dryer was running all day drying sopping wet mittens and coats and pants. Somewhere in there we even managed to finish the basics of schoolwork. What a great way to celebrate--except for the schoolwork part. ...He stayed out long after everyone else went shivering and dripping into the house. This is Misha right before I said, "Misha! Get into the house and put on a WINTER coat!" This is Vitali's Crazy Face. When we see this face, we know that we have about three seconds to redirect him before he throws something or hits someone. That boy has energy he doesn't know what to do with! Outside is the best place to have a Crazy Face. One year ago today our lives were in total upheaval! Now we have settled into our new normal. We still count to six constantly when we go out but it somehow doesn't seem like such a big number...at least most of the time! Leslie suggested in her comment last post that I should post something about how the boys have progressed. Where they were then compared to where they are now. The things they have learned as well as the things that they have still to work on. I think this is a great idea and I am glad she suggested it. If anyone else has suggestions, please let me know! I sometimes run short on ideas. Well, I am off to join the family watching Walker, Texas Ranger. I will have to post video of that sometime! The boys, especially Misha, get so excited during the big fight scene at the end of every episode. It is pretty funny! ...We were sitting on a plane with three very nicely behaved boys leaving Kiev and heading to our connecting flight in Austria. We landed in Austria and it was all downhill from there. Misha was especially troublesome. He thought it was funny to run away so we would have to chase him. He ate a piece of gum that he found stuck to a garbage can; told us where to go and how to get there, and that sort of thing. There, he was the worst, but they all were naughty! After that we were on a plane for nine hours held hostage by three terribly behaved little boys! People looked at us wondering about our parenting skills. Most people who found out that the boys had been in an orphanage only days before melted their annoyed expressions and offered help. We are very thankful to the nice man on the plane that Misha kept waking up and waving to, to the lady in the Austrian airport who gave him a piece of gum that did NOT come off the garbage can, to the families with small children who read books to Misha and to the Romanian Grandmother from Cleveland who rocked Vitali to sleep after seven hours of him mostly crying! We even thank the thoughtful airline which installed seatback televisions and remotes so that Max could play with them in between grumping at us and getting himself locked in the bathroom every 25 ninutes! How great it was to touch down in the USA, getting past customs and immigration quickly because our boys were so horrible the customs agent took pity on us probably because, no joke, we were reduced to laying them on the floor and standing on the edges of their coats so that they would stop running off in three directions while our paperwork was sorted through! What a relief when at last we saw Babushka and Aunt Laurie whose presence was heralded by a bunch of American flags and bobbing red-white-and-blue balloons! ...what a dissappointment when we found out that our flight to Knoxville was canceled! We would be stuck in DC for a few days with some potty mouthed boys and our best friends, the monkey leash and the Dawn Dish soap. Thank goodness for Aunt Laurie and Babushka Eimers!